Took an early morning boat ride from Plymouth harbour and into the Tamar river, which forms the border between Devon and Cornwall. Started at the Mayflower Steps where the convict ships bound for Australia left from. There is a big naval base here and many fortifications from centuries past. Plymouth was heavily bombed during the war and most of the old city was destroyed. Just across from our hotel is a church with only it's outside walls intact. It was left like that as a memorial. We saw several nuclear submarines that can stay underwater for 1 year in an emergency, only need to re-fuel every 11 years and, when retired, need to sit for 30 years waiting for the reactors to cool before they can be scrapped! 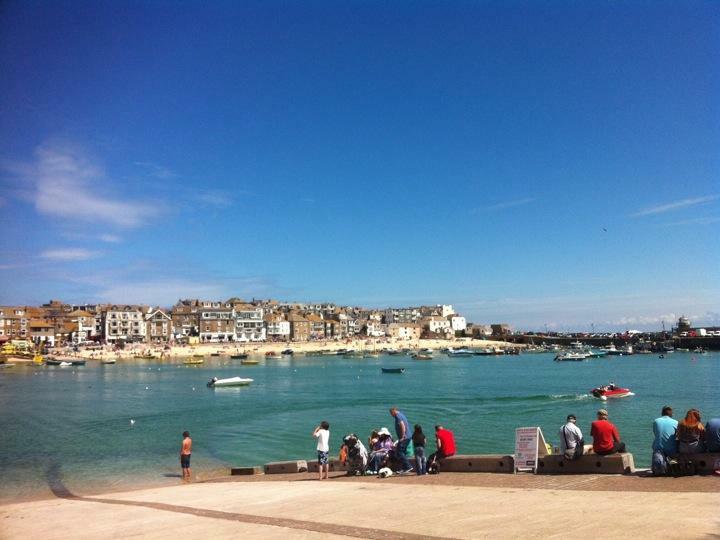 We then headed to the Cornish peninsula with photo stop at St Michael's Mount and lunch at St Ives. Couldn't go past a Cornish cream tea (scone with jam and clotted cream) and Cornish ice-cream. Had to skip the Cornish pasty as too full! Today I dipped my toes in both the English Channel and the Atlantic Ocean (both sides of the peninsula)! We finished the day with a drive along the cliffs overlooking Whitsand Bay (after dinner in a pub, of course). Fantastic views of the coastline!